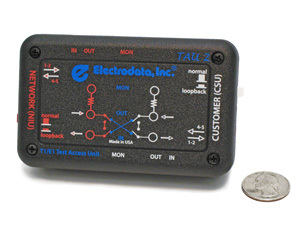 Latest Archives - Electrodata, Inc.
TAU 2 provides the test access capability of a cross-connect panel (DSX), in a small, convenient, handheld package. It provides a complete set of MONITOR, IN and OUT bantam jacks for both circuit directions from the test point. In addition, TAU 2 provides simple switches to loop-back the circuit in either direction. View the datasheet (PDF).